. :: Welcome to National Heart Foundation Hospital & Research Institute ::. 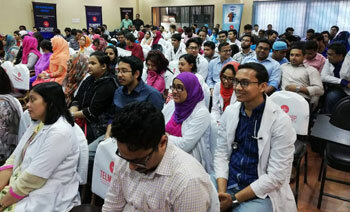 National Heart Foundation of Bangladesh (NHFB) is actively working to create awareness about prevention of cardiovascular diseases in Bangladesh. We are members of World Heart Federation (WHF), World Hypertension League (WHL) and International Society of Hypertension (ISH). 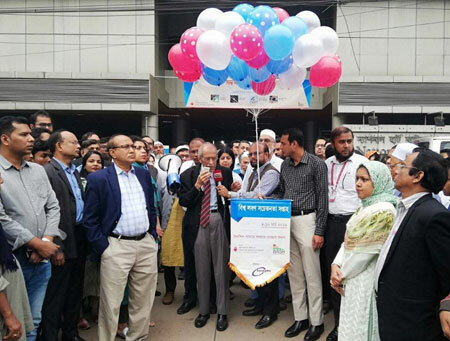 As a member of World Action on Salt and Health (WASH), Hypertension Committee of National Heart Foundation of Bangladesh observed World Salt Awareness Week (WASW) 2019 in a befitting manner through various activities. * On 04 March 2019, an inaugural ceremony was held at NHFH&RI, Mirpur. Founder and President of NHFB National Professor Brig. (Rtd.) 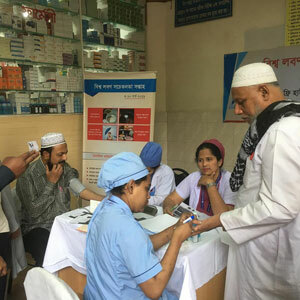 Abdul Malik, Secretary General of NHFB Professor Khondker Abdul Awal (Rizvi), Chairman of the Hypertension Committee of NHFB Professor Fazila-Tun-Nesa Malik informed the general public about the adverse effects of excess salt intake. * NHFB also circulated awareness message in Bangla (লবণ ও লবণযুক্ত খাবার কম খান। উচ্চ রক্তচাপ, হৃদররাগ, স্ট্রাক ও ককডনী স্ট্রারগর ঝুুঁকক কমান - Avoid salt and processed food and stay free from hypertension, heart attack, brain stroke and kidney diseases) through Short Messaging Service (SMS) which reached more than 10 million people in Bangladesh in collaboration with Telenor Health. * We also disseminated digital poster regarding this issue more than 1,00,000 people through social media (Facebook) campaign. * A free Hypertension Camp was arranged at the premises of NHFH&RI. In the HTN camp, blood pressure, random blood sugar, weight and height were measured. High risk people were screened and advised on life style modification and further evaluation. About 300 people received the service. 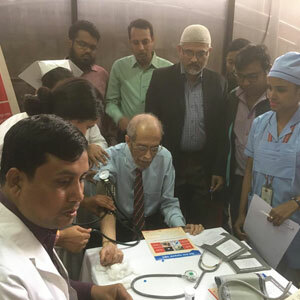 * A scientific seminar on ‘Updates on Hypertension’ was held on 09 March 2019 at NHFH& RI. 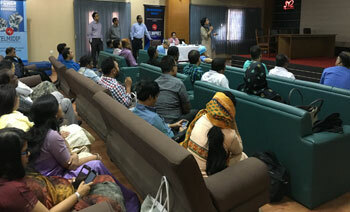 Professor Fazila-Tun-Nesa Malik, Dr. Dhiman Banik, Dr. Tawfiq Shahriar Huq, Dr. M Kalimuddin, Dr. Mir Ishraquzzaman, Dr. Abdullah Al Mamun delivered the lectures. 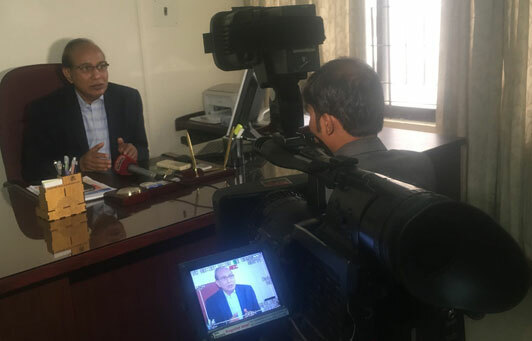 Professsor Nazir Ahmed and Professor M Badiuzzaman presided over the session. Dr. Mir Nesar Uddin Ahmed, Dr. Ashok Dutta and Dr. Habibur Rahman were present as panelists. 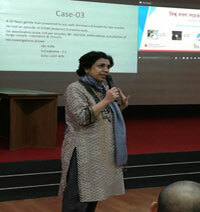 Different aspects of management of HTN were discussed in the interactive session. More than 250 physicians from different districts and Institutes attended the seminar. 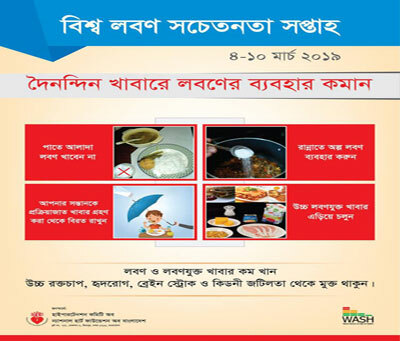 * A colored brochure & poster carrying the message of WASH 2019 were printed to create public awareness for this occasion. 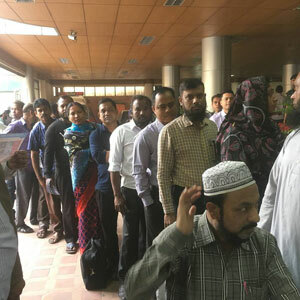 The brochure was distributed all over Dhaka city as well as different districts of Bangladesh through our affiliated bodies. * A talk describing the adverse effects of excess salt intake was telecast on electronic media. At the same time continuous message was shown on the television scroll which carried the theme message of the week.